Freckled Citizen: City or beach? It's pretty easy to get in a real estate funk livin' in the big city. We are not suburban types, which makes several factors more stressful for us as we househunt: space, neighborhood, transit accessibility, style, COST. Even still... walkable streets, people and activity around us, neighborhood shops and restaurants, urban parks, like-minded folks... these are the things we hope to continue to be able to prioritize. Half of what I do for a living involves promoting lifestyles exactly like the one I just described, making them more possible through transit. We talk to community clients about the time savings and lifestyle benefits of one less car payment (or none at all), no commute, on and on. So I get that a higher pricepoint for a rowhome in the city comes with ample savings elsewhere. More importantly, I'm just happier this way. I regaled my siblings over the weekend with the tragedies we've seen on Open House Sundays: the "value-priced" $500k rowhome that looked perfect from the outside, but was only 562 square feet inside. The places priced beyond our wildest dreams that still needed to be torn apart inside. The idea that asking for a third bedroom is the equivalent of needing to win the lottery (I'm not greedy, I just need a home office!). The concept that a million dollar home is not only not a mansion, it might not even have two bathrooms. So sure, this is probably the stuff of fantasy, too. But seriously... kind of genius, no? How do those of you living in expensive cities deal? No, really. I'm all ears. I vote for the BEACH HOUSE! Then I have two places to come visit! I'm also on the soul sucking city real estate prowl and I just thought of this today. Seriously. And I thought I was genius. I grew up in NYC and have always had this picture of the townhouse on the leafy street near the good deli and just assumed it would be possible. It is, if I take on a career as a cat burglar. In any event, at very least, it's an idea worth thorough investigation. I've pitched this exact idea to Andy on a number of occasions, although in my case it's a country house, not a beach house – but I get vetoed each time. Le sigh. 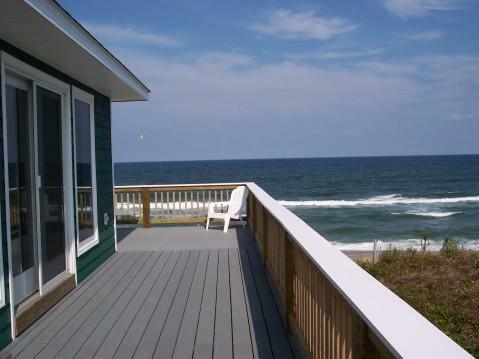 But a beach house sounds really nice right about now! I have no idea how they do it! I would love to have both! How awesome would that be?! I'm shopping for sunscreen already! It's a good idea. NYT had an article on this a few years ago & we tossed this idea around when living in Berkeley. City real estate is often so overpriced - it just doesn't make sense to leave a nice rental to pay more $ to live in a place that isn't as nice. The tax savings aren't that great - plus either way you can still deduct your home office portion of the rent if you itemize. I say go look at beach houses - the open houses will hopefully be more fun! my sister and her husband brought this up during their search but they ultimately decided on a townhouse in northern va. it seems like a good idea though- i mean, a beach house is never a bad idea, right? i'm with you on the city thing. i never want to move to the burbs! and in our situation, renting in a nice area with our three animals was going to be more expensive than our mortgage payment. and oh yea- that's how people do it. HUGE mortgages. ugh. BEACH HOUSE!!! I live in Knoxville, Tennessee (as you know) so my experience of buying in an expensive city is nil. BEACH HOUSE!!!! It's good to have options and keep your eyes open - you never know when that perfect little row house will pop up in your price range! Maggie... rental income with a beach house! You might be able to pay a good chunk of the mortgage if you rent it out during the summer season. Not a crazy idea at all (and that means a lot coming from the perpetual voice of reason). I so feel you. The real estate situation in this town is...humbling...to say the least. I feel like a grown-up most days until I come home to our 525 sq foot (1 closet, no balcony or the like) condo in Rosslyn and feel like I am college all over again. Expect, oh wait, we paid $300k for this place! Ugh! And we aren't even in DC proper. The one silver lining (and you MUST keep this in mind, as my husband insists I do when I get down and out) is that this town is insulated-- the federal gv't keeps prices high even in the worst of economic times. In other words, buying in this town will (EVENTUALLY? )pay great dividends! Amanda & I have some experience with this very subject. Both of us have enjoyed living in Providence, a small city with access to all the useful city things, and we haven't been interested in owning real estate. However, a family emergency a few years ago forced our hand, and we bought my father-in-law's house in New Hampshire. I tell people these days that we bought our second home before our first, and we probably won't buy our first! Maggie, you have a good eye for home design; as long as you can make your home comfortable for you (rented or otherwise), then that's where you belong. Rent for as long as 1) it makes sense financially (http://www.nytimes.com/interactive/business/buy-rent-calculator.html) and 2) it give you the home that you want. oh Mags...welcome to D.C. darlin'! That's why I enjoy my 3200 square foot home, that I paid just over $400k for....in the BURBS :) But I do find myself craving the city life more and more as I get older. When that time comes, I grab the hubby and book a weekend downtown for pampering and culture. I am all for your beach house plan, rent it out and it will pay for itself!